Ms. Rashmi Singh is a distinguished alumna of the Humphrey School of Public Affairs. She was one of the first administrative officers selected by the Indian Ministry of Personnel and Training to attend the University of Minnesota to earn a master of public affairs degree. During her time at the University, she broadened her knowledge about how public-private community partnerships can alleviate poverty and work toward women’s empowerment in sustainable and inclusive ways. 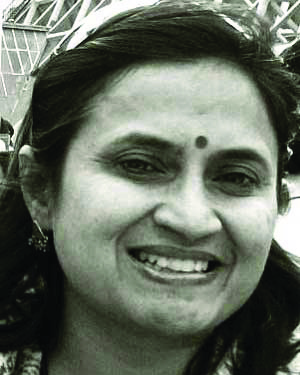 After Ms. Singh returned to Delhi, she founded Mission Convergence (Samajik Suvidha Sangam)—an idea that emerged from her study of integrative leadership at the Humphrey School and the Carlson School of Management. Using her strong leadership skills and positive personality, she was able to convince the Delhi government that the first step toward reducing economic disparity and empowering the poor would be for the government to expand the social security net in partnership with non-governmental organizations (NGOs). Mission Convergence now coordinates the work of a multitude of NGOs and the government of Delhi, making more than 40 government programs accessible to millions of people who live in poverty. Ms. Singh credits her studies in integrative leadership at the Humphrey School for the inspiration to form Mission Convergence. In return she has welcomed Humphrey School students as interns at the organization. As the founder and director of Mission Convergence, Ms. Singh single-handedly led the Delhi government to reform its corrupt and inefficient welfare delivery system in favor of a transparent system based upon people’s needs. She also worked toward incorporating grassroots knowledge and networks of hundreds of Delhi NGOs to survey millions of poor citizens. The collected data was used for reforming the welfare schemes and for introducing new programs targeting the social, economic, and educational development of poor women. Mission Convergence is a world model for cross-sector collaboration on a scale never before imagined. It is an innovative model of governance reform, focusing on inter-sectoral convergence, community empowerment, transparency, accountability, and a rights-based framework replacing a compartmentalized, fragmented approach to development with a focus on inclusion and gender involvement. The convergence works toward inclusive growth and gender equality in the city-state of Delhi, India’s capital and home to fifteen million people. The success of Mission Convergence shows Ms. Singh’s ability as an outstanding leader. Widely heralded as an innovative governance structure, Mission Convergence was awarded the Commonwealth Association for Public Administration and Management’s Gold Medal Award of Excellence in Innovations in Government Services and Programs. Since Mission Convergence was formed, Ms. Singh has been asked to speak around the world to talk about the success of the organization. In naming Ms. Singh a recipient of the Distinguished Leadership Award for Internationals, the selection committee cited her transformative leadership skills as the founder and director of Mission Convergence. Ms. Singh has affected and improved the lives of millions of people and inspired new heights of multi-sector collaboration. She embodies the very best qualities of transformative leadership.